Thanks to a mother who watched a lot of horror movies when I was a kid, I had and still to some extent have reservations about being in the dark. So when the power went out in the middle of a late, late Thursday night… I had no choice but to sit in the dark with a flashlight and candles and wait for it to come back on (Which it did…. at about noon the next morning). 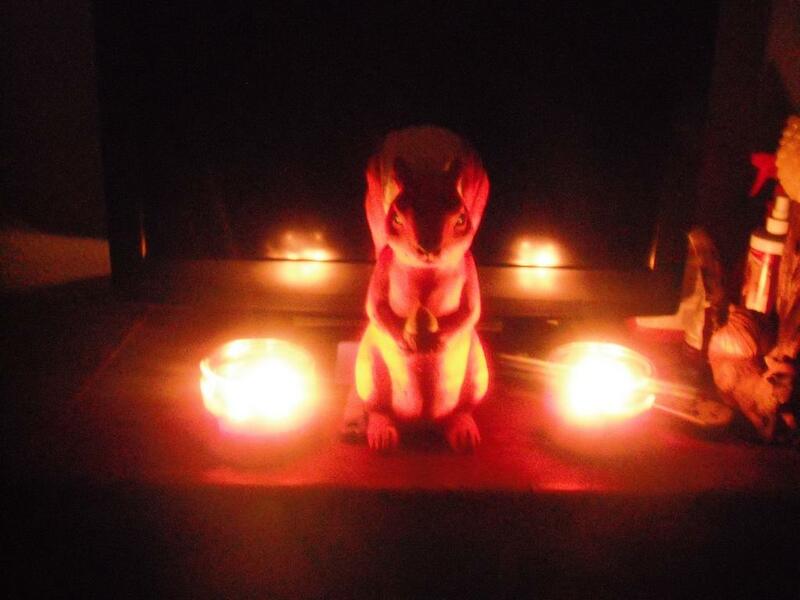 Since sitting in the dark without technology can be extremely boring, the candles gave me an idea to take the squirrel lawn ornament I had just painted to look like my red squirrel character MBRS (remember her?) and set her on top of the entertainment center in front of the blank TV. This photo looks creepy now as I type this post in broad daylight. I can’t believe I actually set it up at about 4 in the morning when every light in the entire neighborhood was out. The reflection of the candles really make MBRS look evil as all get out….. yikes! This entry was posted in My Top 200 Photos and tagged altar, candle, dark, evil, mbrs, photo, photography, power outage, scary, spooky, squirrel. Bookmark the permalink. She does have those Chucky eyes…. Had to look up marzipan (culinary stuff is a huge black hole of mine). I thought maybe it was a new type of squirrel I’d never heard of that people would want to (gulp) eat! It probably is! A new kind of squirrel foodies might want to eat, that is. She does have a bit of evil about her…..instead of a tail behind her head it looks like a vampirish (?) cape hood…..she’s about to sacrifice an acorn to the God of darkness when…whammo….the lights come back on and she’s just a painted squirrel. Talk about a downer! Neat! The tail does look like a cape! I hadn’t notice that before. Given that MBRS was kinda Mitzi before there was Mitzi, it’s troublesome to see her with such an evil look while she has nuts in her paws! MBRS, now there’s a blast from the past! Yeah, why not? Besides, maybe if I’d have thought to sacrifice Buster to our dark squirrel lord, the power would have come back on sooner. Candlelight is lovely in the summer. Boring, but lovely. in the winter, the cold starts to take out your toes! Cool looking squirrel. i don’t think she looks creepy. I think she looks sorts of romantic. She does have that sultry gleam in he eye, in a black widow sort of way…..